Coming home to a heated environment is the worst situation ever. We are sure that you want to be comfortable when you return home. Anyway, there are many ways to get your room naturally cool and one of which is to equip the home with a window air conditioner. Air conditioners come in many types but the window mounted one is among the best at cooling the room quicker with less energy consumed. Sift through this review to get to know the top rated window air conditioners on the market. The Frigidaire FFRA0511R1 is the window-mounted air conditioner that is capable of cooling the room up to 150 square feet. It is designed with two cool speeds, two fan speeds and two-way air directions which will cool your room quickly with less noise produced. This model comes with low power startup which means the energy will be consumed to cut down costs on your electrical bill. 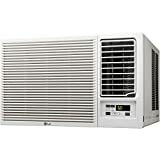 If you are to get the air conditioner that fits best with your living room condition, consider this LG LW8016ER. This item is the window mounted model that comes with 8,000 BTUs to be the best suited for rooms up to 340 square feet. With the 12.1energy efficiency ratio, your room will be cooled up much faster with less energy consumed. They also add 3 cooling speeds and another 3 fan speeds for air conditioner cooling flexibility as well. This LG air conditioner is constructed with anti-corrosion coating for long durability. Consider this HomeLabs window air conditioner if you want to cool your 150 square feet bedroom. This ac features 7 speeds with two-way airflow and adjustable fan which comes to reduce heat in your room within 10 minutes. 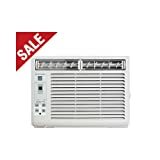 This 5000 VTU window air conditioner requires 110-120V electric outlets to be operated. It is equipped with the washable filters for easy maintenance for the long lifespan. Enjoy staying in the house during the hot weather with this less noise produced with this window air conditioner. 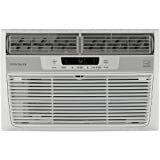 This window mounted air conditioner is the best wall mounted item we have come across from Fridgidaire. Along with 10,000 BTU and 115V electrical outlet, this air conditioner will be able to cool the room up to 450 square feet much faster and easier. There are many modes for you to choose as well including auto cool, sleeping mode, energy saving mode and so on. Plus, it also features 8 way air directions with the filter that can be washable for longer use and healthier environment. 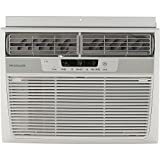 Here is another mini compact window mounted air conditioner from Fridgidaire with 5,000 BTU. It fits well with the window that has 23 to 36-inch width and 13-inch height. To add more, this air conditioner can cool your 150 square feet room very quickly with low power startup and less energy consumed. Enjoy your comfortable feeling in your cool room with this air conditioner model from LG. This one is the perfect deal for any 550 square feet room and it will cool your room much quicker than ever. It is made with three cooling speeds, three fan speeds, and four-way air direction with auto cool mode that can even cool across the room. Designed with anti-corrosion coating, this air conditioner can be used for long and save much energy as you wish. This LG model, LW6017R, supports up to 6,000 BTU cooling area and can quickly cool the room up to 260 square feet. It includes 3 cooling speeds, 3 fan speeds and auto cool this window mounted air conditioner for cooling flexibility. Save much energy, save more money with the energy saving function offered by this item. 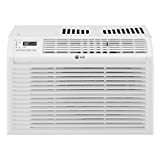 This Frigidaire FFRE0533Q1 wall mounted air conditioner will cool your 150 square feet room much faster than you have expected. This air conditioner model requires 115V electric outlet to be operated but it is designed with low power start-up and operation to reduce the amount of electric used. You can control the temperature and the speed as you want while you can clean the filter for healthy environment. Besides cooling your 350 square feet room perfectly, this air conditioner model will also clean and impure the air to offer you healthy breathable area. It can support up to 8,000 BTU with 115V electric outlet needed for operation. With this model, you can control your room temperature, you can adjust to your desired mode, and you can also change the direction of the air up to your wish. The last air conditioner that appears in our top ten best window mounted air conditioner is LW8015HR, a model from LG. It is designed with 7,500 BTU cooling capacity that will quickly cool your 320 square feet room perfectly with its 4 way air directions feature. There will also be additional energy saving function that could possibly conserve more energy and cut down your electric expense. After presenting to you ten best window mounted air conditioners, we are sure that your cooling problem is not the matter during the hot season anymore. 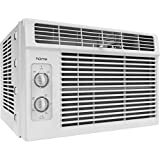 All of these air conditioners above are highly recommended since it can cool your room quickly, can live for longer and can save your energy as well as your money. Consider one of this frontier if you are to cope with your so-hot room. 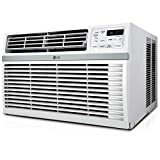 Most of the window mounted air conditioners can be purchased at affordable price which is a perfect deal for the one who is in short of money or the one who is in short of space. Not just less money is required for purchasing, but you will also find it cost efficient for your monthly electrical bills too. Window mounted air conditioners, these days, have the great energy efficient ratio which allows itself to know how much energy to consume in order to cool your room effectively. By comparing the space to cool to the energy consumed, your energy will be saved for sure. Regarding installation or mounting process, this kind of air conditioners can be mounted by yourself easily. You do not need to spend money on getting someone to install this for you anymore. With the installation kit and installation instructions given along in the pack, you can get it done in a snap.